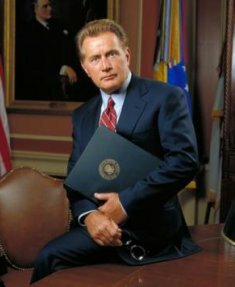 IT is one of the most critically acclaimed shows in the history of television, but last night's premiere of the new series of the West Wing left British viewers perplexed. Channel Four said it had received assurances from the show's US producers that while the latest episode of the political drama seemed very slightly different, it would be 'back to its old self' next week. West Wing fan Bill McKay, from Barnsley, said: "It started very well. As usual, I had absolutely no idea what was going on or what they were talking about. "I'm fascinated to see where this is going. I hope that Josh manages to persuade whoever it is he's dealing with to do whatever it is he wants them to do." Mr McKay added: "You do understand that as an older man it's very important that I get to watch CJ at least once a week." A Channel 4 spokesman said: "We are disappointed they have dropped the famous theme music. People enjoyed reading the name WG 'Snuffy' Walden. "But while this may seem a little odd to the show's loyal fans, we can assure them that this is the West Wing. Just the same old West Wing." ENTERTAINMENT giant Disney is to remove all images of patio heaters from its films. Despite accusations of censorship Disney will ban depictions of patio heaters in family films while patio heaters will be "discouraged" in films for adults made by its Touchstone and Miramax studios. Meanwhile all Disney DVDs will carry stark warnings and show pictures of warm European people outside bars smoking cigarettes and drinking vodka. But film historian Wayne Hayes said: "The March of the Patio Heaters from Fantasia was groundbreaking. "In Bambi, the poor little fawn is all alone in the world until he strikes up a friendship with the wise old patio heater. 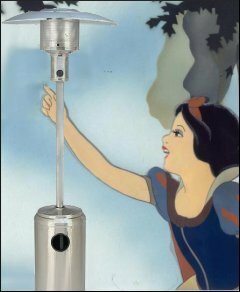 "And what child could ever forget that beautiful scene from Snow White when she pretends the patio heater is her prince charming?" Hayes, author of Gassy: Hollywood and the Patio Heater, added: "Walt Disney himself would spend long winter evenings sitting around the patio heater with his friends, making anti-semitic remarks." But Tom Logan, spokesman for Patio Heaters Endanger the Lives of Children (PHELCH), said: "If children see their favourite characters cavorting with a patio heater they will pressure their parents into buying one." Describing patio heaters as a 'gateway polluter', Logan added: "As adults they will move from patio heaters to gas barbecues and 4x4s. "Eventually they will set up their own coal-fired power station and will have the coal delivered by passenger jet." Disney is also to ban images of frowning, arguments and disappointment. Chief executive Robert Iger said: "The world is a happy place. At Disney we have no time for grumps and grouches. We prefer to show them being killed in cruel and unusual ways."